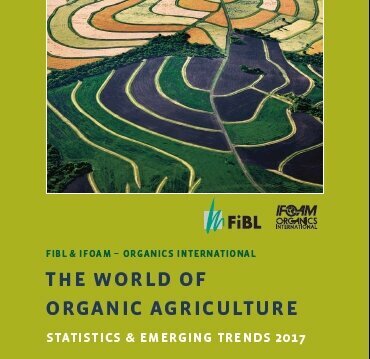 The World of Organic Agriculture: Statistics & Emerging Trends 2017 is providing a comprehensive analysis of the development of the organic market worldwide. GIZ ASEAN Sustainable Agrifood Systems (ASEAN SAS) assisted the Research Institute of Organic Agriculture (FiBL) to collect information of organic production and trade in Cambodia. Since 2011, GIZ ASEAN SAS in cooperation with the Cambodian Center for Study and Development in Agriculture (CEDAC) is promoting organic rice and vegetable value chains. ASEAN SAS intervention along the organic agriculture value chain cover inputs, production, logistics, regulation, certification, logistics, processing and marketing. Project partners come from the private sectors, other development agencies and the Ministry of Agriculture, Forestry and Fishery (MAFF) with which the project develop a regulation for Biocontrol Agents and a National Standard for Organic Agriculture. With previous projects GIZ and its Cambodian partners were pioneering the development of a national market and the first one to export organic certified rice to the US and the EU. Having understood the benefit of organic production for health, environment and sustainable development, the demand for organic produce in Cambodia is increasing. By 2015, the organic production occupied over 12,058 hectare (2012: 9,055 ha) which is about 0.2 percent of the total agricultural land in Cambodia. The total producers are 6,753 families. Beside rice as the biggest organic crop, cashew nuts, mango and pepper are increasing under organic production. Noting that the sector is still small there is a big interest in investing in this sector. The publication is compiled by FiBL and International Federation of Organic Agriculture Movements (IFOAM). It is our pleasure to assist the production team in the data collection. Also, we are happy to provide any information about the organic market in Cambodia in the future to any organization or individual upon request. The complete publication can be found here: http://www.organic-world.net/yearbook/yearbook-2017.html .